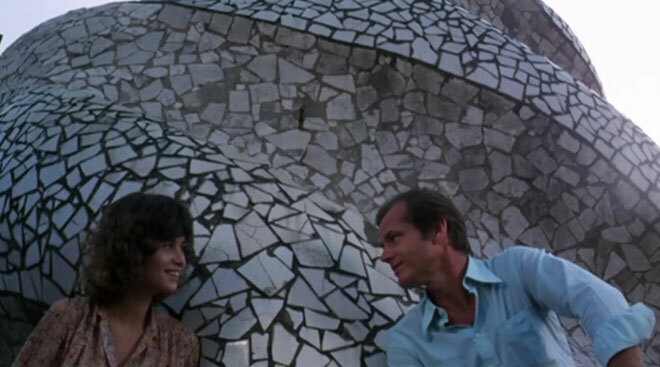 Perhaps anticipating the ultimate act of reportage—Profession: Reporter is how the Italian title literally translates—from beyond the shores of the self, journalist Jack Nicholson trades identities with a dead man in a hotel room at the end of the Sahara Desert, in a movie that ends with another dead man in another hotel room, the desert outside growing ever closer. With his new life Nicholson gets more than he bargained for, including an arms deal he’s in no position to negotiate—or does he? We don’t know because we never know what the bargain is or whether, for that matter, Nicholson knows. This is one of Italian filmmaker Michelangelo Antonioni’s great cinematic riddles, and as such is not for those who need their riddles answered but rather for those haunted by the beauty of what can’t be answered—a mystery that Paul Bowles might have written. Chaos and violence hover at the edge of The Passenger as they do for all Antonioni’s movies, the difference being that the human cipher at the center isn’t a beautiful blonde but one of the last actors who can get by on star power alone, in one of his last quiet performances, accompanied by a Maria Schneider still erotically shellshocked from being defiled by Brando in Last Tango in Paris. Recalling the conclusion of Antonioni’s own l’Eclisse, the justly famous seven-minute circular pan at the end of The Passenger nearly swallows up the two hours that precede it.